How do Task due dates work? Because Tasks are part of a piece of work, there are 2 options to set the due date. 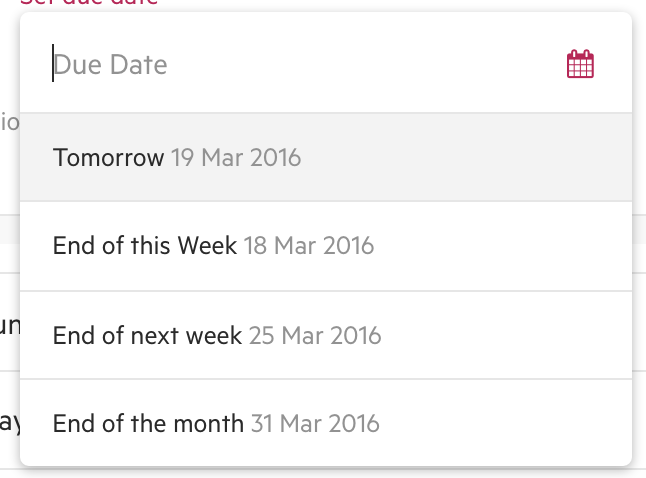 A hard date is a fixed date you select by using the calendar or typing in a date. If you copy this Task section, or create repeat work, this date will not show up in the new Task list. This date is based on how many days from the work start date the Task is due. For example, due 0 days would mean the item is due on the start date of the work. Due in 15 means the item is due 15 days after the start date of the work. You can set the due in date by picking a date on the list view or by typing the number in the list view — ie, if you select from the dropdown option, it’ll be a date from the start date of the piece of work. Why would you pick Due in dates? These are powerful when you repeat work as Karbon will carry across the “due in” date to the repeated work and update the Task due dates based on the new work start date, reducing the amount of time you would spend updating all due dates. If you make a mistake, you can remove a due date.